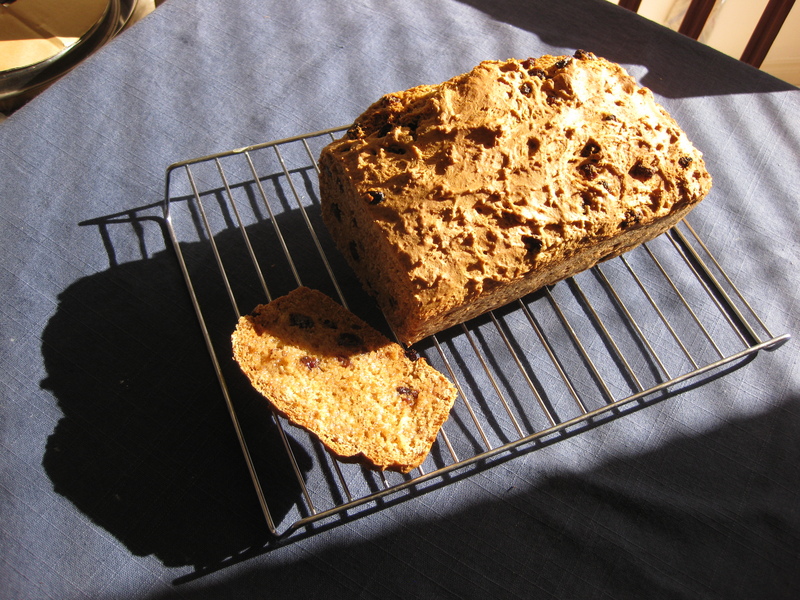 veganmofo 9: Cinnamon Raisin Bread | Go Fork Go! Living alone is terrible for veganmofo posting. See, living alone means that when I make a dish, the leftovers feed me for days and days. While I’m perfectly happy eating the same thing day after day, when the theme of my veganmofo month is “new things in November”, it means I don’t have a whole lot to post about. But here’s something. It didn’t turn out too bad but the taste of the whole wheat flour is definitely present (does anyone know if whole wheat flour goes stale? I’m pretty certain the bag I’m using is from 1999 or something like that). It’s also more like a banana bread in terms of density (no yeast, remember) than commercially produced loves of cinnamon raisin. Nevertheless, it’s great with a smear of margarine and I’m sure would be terrific with jam or peanut butter. If I had any. Oh great, now I want to go buy some. Thanks. I thought about baking a loaf of yeasted cinnamon raisin bread (now that I bought a small jar of yeast) for um… comparison purposes… but I dont think my waistline can take that. I’m waiting for veganmofo to be over for one reason: I can stop feeling this compulsion to cook and bake things. Looking at the blogs just makes me want to make more stuff… not helpful! The other reason I wanted to post this was to say: look! sun! We’re heading into winter and the gloomy days are beginning to outnumber the sunny ones, particularly last week. After the snow last Friday, I was very excited for sun during the weekend. It’s been sunny since then. Sadly, I’ve mostly been at work. Ah well.